Building a winning Microscale LEGO model! Microscale is the term used to describe anything built smaller than minifigure scale, so technically all of the LEGO Architecture series models, as well as the giant LEGO Ships like the Imperial Star Destroyer are microscale. In practice, the term has evolved to mean building as small as absolutely possible to capture the raw spirit of a building. In most cases, we are talking about entire models less than 8×8 studs in size. 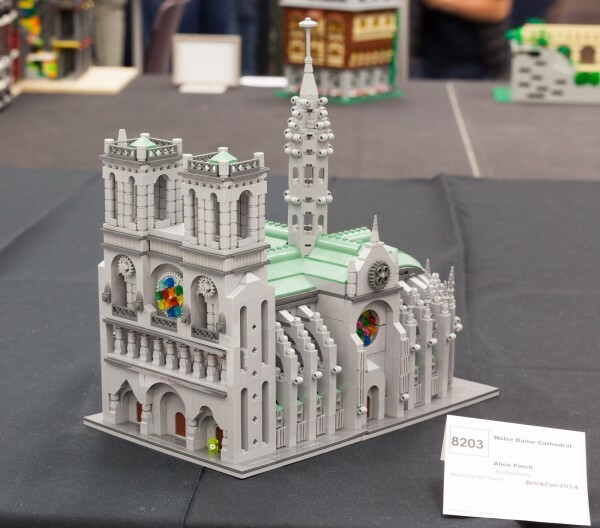 Even this amazing medium-sized model of Notre Dame by Alice Finch is technically “micro scale” since it is smaller than mini-figure scale. There is a whole section at BrickCon for microscale models. The majority of the models are of intricate tiny buildings, but you also sometimes see tiny military scenes involving 2-stud tanks and other micro machines. 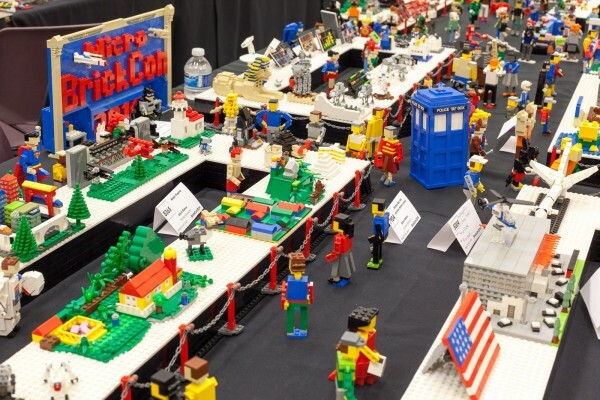 Steve Oakes, a long-time LEGO builder in Seattle area started a tradition 4 years ago to re-create the BrickCon Public Convention at a smaller scale. His display is called “Micro BrickCon”, and it features Miniland-scale (about 11 bricks tall) brick-built LEGO figures touring several LEGO tables containing microscale LEGO models. Some of the models on display at Micro BrickCon are custom creations, and others are Microscale recreations of larger models on display elsewhere at the convention. 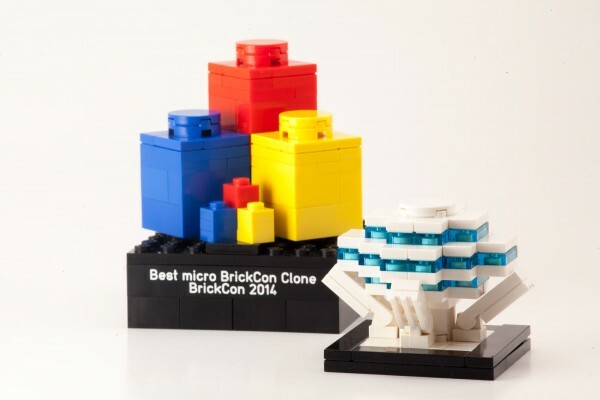 Micro BrickCon is organized every year by Steve Oakes. 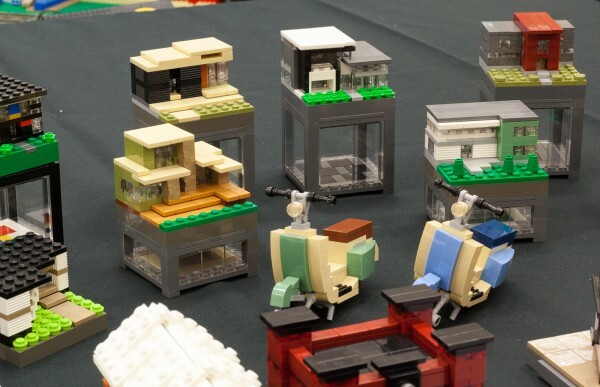 Since Micro BrickCon was not far from where my Architecture models were being set up, I talked to Steve a couple times on Friday about his display, and he indicated that he really loves it when people bring in a microscale version of their main display to add to Micro BrickCon. 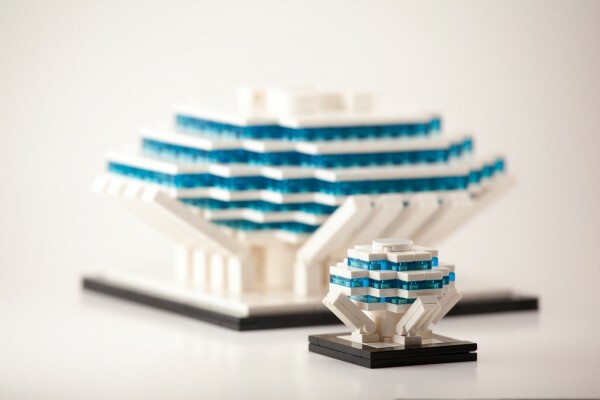 This got my gears turning, as I was intrigued by the prospect of making an even smaller recreation of my Geisel Library model. That evening, I collected some specialty parts at the house which I thought might work in creating a tiny version of the library model. Since most of my common parts were in a set of drawers that I brought to the convention, I planned to build it in the morning before the visitors arrived at 10:00. I was delighted that my idea for the building came together so effortlessly. Within about 10 minutes, I had a perfect tiny model of the library, and I presented it to Steve who was happy to put it on display just as the very first guests arrived for the public showing. My micro-scale version of the Geisel Library which I displayed in Mini BrickCon. I rather expected that would be the end of this story, but I was delighted to receive recognition for my Microscale Geisel Library at the awards ceremony Saturday night. Lots of other really impressive models received accolades including an unbelievably intricate diorama of the book Mouse Guard by Paul Hetherington (best of show), an encore showing of Tiger’s Nest Monastery by Anu Pehrson (people’s choice), as well as an unbelievably compact and beautifully detailed Notre Dame Cathedral by Alice Finch that I showed earlier. The trophy is a lot bigger than the model! I’m really happy with my microscale creation. It definitely captures the spirit of the original model, and it is really TINY! I hope you enjoyed it, and I hope that I get a chance to build more awesome-looking LEGO models, big and small. Welcome to the party, Tom…. That’s great to hear, Steve! I’m happy that you enjoy the book and you earned some credibility with the kids since I know you!